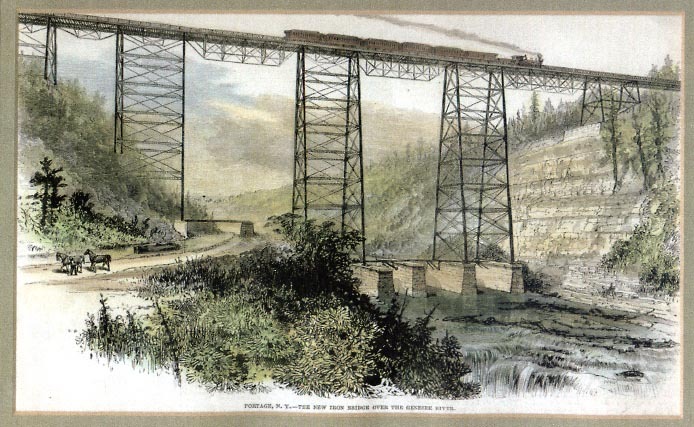 "The New Iron Bridge over the Genesee River"
This wonderful drawing appeared in "Gleason's Home Circle" in 1875. The artist showed both the towering new Iron Bridge and the remains of the Wooden Bridge - visible in the River just above the Upper Falls. To do this, of course, the artist had to take some liberties with the distance between the Bridge and Falls. Most of the debris was actually in the River below the Falls. 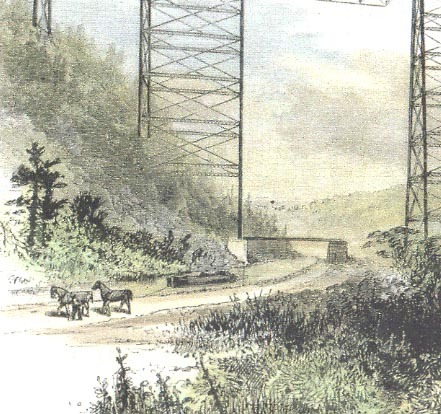 The artist is easily forgiven however, because they included the Genesee Valley Canal seen to the left of the River. A boat is being towed north, having just passed under the Bridge. The Canal, incidently, would be gone only a few years later! You can get a close up of the Canal by clicking on the image or scrolling to the close up below. Also see our Glimpses of the Portage Bridge and the Genesee Valley Canal. Actual photographs of the Bridge, Falls, and Canal, can be found in our Historical Photo Album.